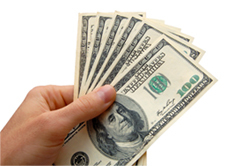 Find out how much money you can save when you use a Central Boiler outdoor furnace. The calculator can even show you how your savings can grow if you finance and/or choose to invest your savings. Be sure to consult a dealer when sizing. Previous heating efficiences and heat loss need to be considered when sizing a furnance. This is only a guideline. The sizing calculation estimates the existing fossil fuel(heating oil, propane, natural gas) heating equipment performing at 75% efficiency. This calculator estimates your cost savings based on the assumption that you obtain your own firewood at no cost to you. In addition, the calculation is based on the alternate energy costs and units of energy that you supply. If the costs or units of energy vary over time the actual cost savings could be more or less. The results that you obtain from the calculator are therefore not a guarantee of annual cost savings that you can expect to realize.